Go vote. Give them your opinion. 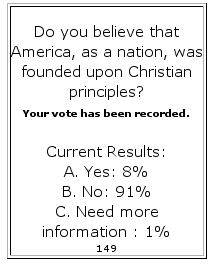 This entry was posted in Culture Wars and tagged Culture Wars, polls. Bookmark the permalink. I just voted. The tally is now 4% yes, 95% no and 1% needs more info.